While once the height of interior design, today many people find that dark paneling gives a room a dated, dull and dark look. Removing the paneling is an option if you are prepared to deal with whatever you may find behind the paneling. Painting over the paneling is also a possibility. Using a whitewashing technique can brighten and update a room with very little money and much less effort than removing the unwanted dark wood. A paint brush or sponge will help you brighten dark paneling. Lay down drop cloths to protect flooring or furniture that may be damaged. Use painter's tape to protect light switches or light fixtures that cannot be removed. Lightly sand the walls with steel wool or fine grit sandpaper to remove any glossy finishes and give the wood "tooth" so the whitewash solution will adhere better. Wipe down the walls with a tack cloth or lightly moistened cleaning cloth to remove the sanding residue. Tack cloths are treated to be slightly sticky and are available in the paint department of your local hardware or home center. Take care with this step and make sure the walls are free of grit before attempting to whitewash them. Pour equal portions of off-white, flat latex paint and water in a container suitable for paint. Stir with a paint stick until the ingredients are well mixed. The solution should be creamy but not runny. Begin inside a closet or in an inconspicuous corner of the room. 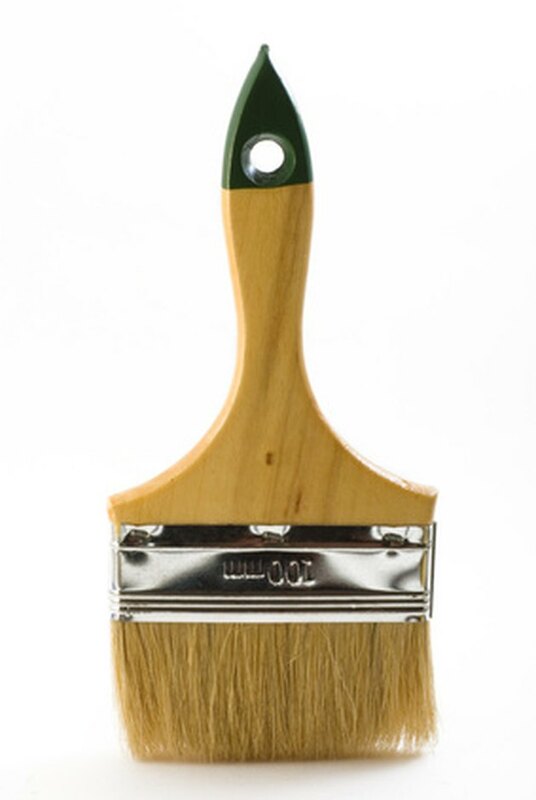 Use a paintbrush or a painting sponge and apply a light coat of whitewash by following the grain of the wood. A dry cloth or sponge may be needed to wipe down streaks. It may take a few strokes to find the application method that works best for you. Continue to work in small sections until the whitewashing is complete.